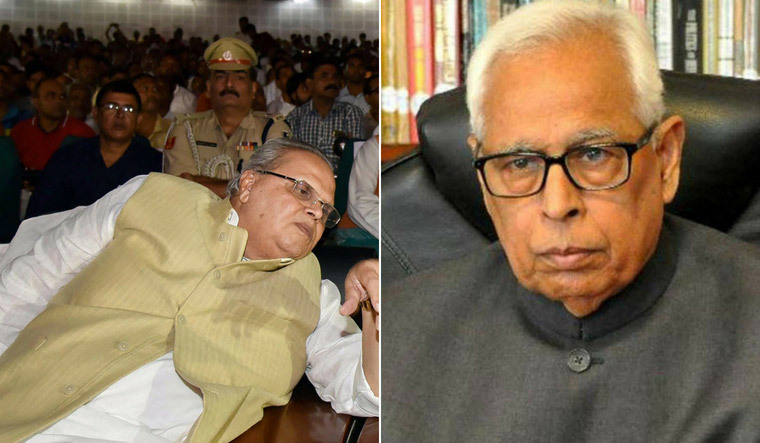 Bihar Governor Satya Pal Malik was shifted to militancy-hit Jammu and Kashmir in a gubernatorial reshuffle that marked the end of over a 10-year tenure of N.N. Vohra and also the appointment of a politician to the crucial post in more than five decades. Read: J&K governor? A politician, please! The announcement of the appointment of Malik, 72, in a Rashtrapati Bhavan communique appeared to indicate a change in the Kashmir strategy of the Modi government. Since 1967, the Centre had chosen retired civil servants, diplomats, police officers and Army generals for the post of Governor of Jammu and Kashmir. The state is currently under Governor's rule after the BJP pulled out of the ruling coalition with the PDP in June this year. President Ram Nath Kovind also appointed Lal Ji Tandon, a BJP stalwart from Uttar Pradesh and a close confidant of late former Prime Minister Atal Bihari Vajpayee, Satyadev Narayan Arya and Baby Rani Maurya as governors of Bihar, Haryana and Uttarakhand, respectively, according to the Rashtrapati Bhavan statement. Arya and Rani Maurya are also from the BJP and hail from Bihar and Uttar Pradesh, respectively. Karan Singh was the last Governor of Jammu and Kashmir with a political background. He served from 1965 to 1967. The appointment of Malik, who will head the administration in the border state, also comes against the backdrop of the changing political scenario amid speculation of the possibility of some disgruntled MLAs in the Mehbooba Mufti-led PDP joining hands with the BJP. Malik's appointment brings to an end the tenure of Vohra, a former civil servant who took over as Governor of J and K on June 25, 2008 at a difficult time when the state was facing the Amarnath land row agitation. Malik, who has been associated with almost all political parties, started as a socialist leader in Meerut University during his student days to finally become the vice president of the BJP before being appointed as the Bihar governor last year. Malik was with the Bhartiya Kranti Dal, Lok Dal, Congress and Janata Dal and the BJP during his long political career. He became the MLA of Charan Singh's Bhartiya Kranti Dal from Baghpat in Uttar Pradesh in 1974. He joined the Congress in 1984 and became its Rajya Sabha MP but resigned three years later in the background of Bofors scam. He switched to the V P Singh-led Janata Dal in 1988 and became an MP from Aligarh on its ticket in 1989. In 2004, Malik joined the BJP and unsuccessfully contested the Lok Sabha elections, losing to Charan Singh's son Ajit Singh. Before taking oath as Bihar governor on October 4, 2017, he was in-charge of the BJP's Kisan Morcha. Malik had served as the Union Minister of State for Parliamentary Affairs and Tourism and held many important positions at the central and Uttar Pradesh government. The 61-year-old Baby Rani Maurya, who goes to Uttarakhand, is a BJP leader from Agra. She replaces former Delhi Police Commissioner K K Paul on the completion of his tenure. Arya, 73, is an eight-term MLA from Bihar. He was a minister in the 2010 BJP-JDU government in the state. As part of the reshuffle, Haryana Governor Kaptan Singh Solanki has been transferred to Tripura replacing Tathagata Roy who is shifted to Meghalaya, according to the Rashtrapati Bhavan communique.